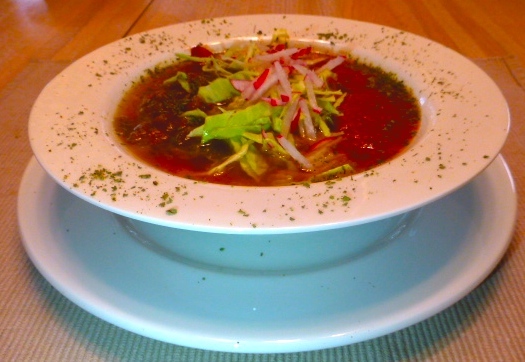 Posole, a pork or chicken soup with hominy (posole) is great on a chilly evening. Tonight was not so chilly, but posole just sounded right. I had some pork loin chops in the fridge, so I cut them into a 1/2 inch dice. I chopped about 1/2 an onion and minced 3 medium garlic cloves. I sweated the onions. When they were about done, I started adding the pork cubes in small batches so they would cook and get a little color. I added the pork in a total of three batches, then tossed in the minced garbled for a few minutes to let it bloom (smell like garlic). Then I added a about 3 cups chicken broth, 1 can of hominy and about a cup of water. I brought it to a boil on the stove top, then transferred it to a crochet to simmer for about 3 hours. At serving time, I ladled the plain posole into a nice rimmed dish and did the New Mexico red and green thing… a few tablespoons of red chile sauce on one side of the bowl and a few tablespoons of green chile sauce on the other. I did a traditional row of grated cabbage and julienned radishes down the middle and sprinkled all with dry Mexican oregano Steamed corn tortillas and a little butter on the side made it a great meal! And really very simple. When you buy a nine pack of center cut boneless loin chops, you are in for a few nights of wonderful treats. Here’s a bowl of red chile (chile colorado) topped with Mexican crema and cilantro, Mini-tortillas make it a bite by bite treat. 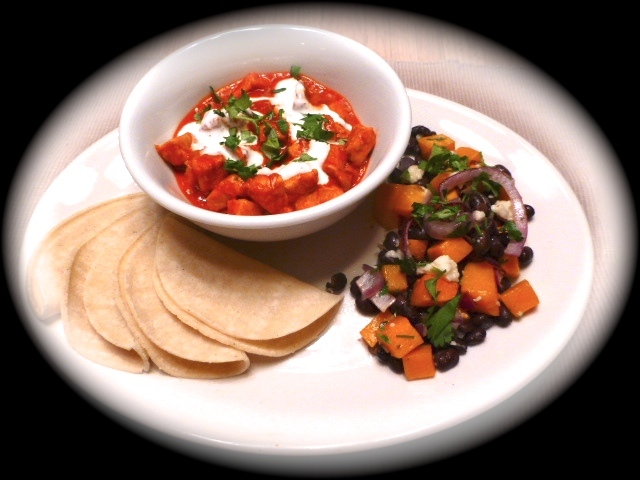 On the side is a roasted butternut squash and black bean side dish with queso fresco and cilantro that is likely to be come a house favorite. Amazing combination of flavors and textures to temper the heat of the red chile sauce. As the Gringo Gourmet, I do demonstrations of cooking prickly pear cactus (nopales) in nontraditional ways. Check the recipe category for the nopales and jicama salad pictured here. 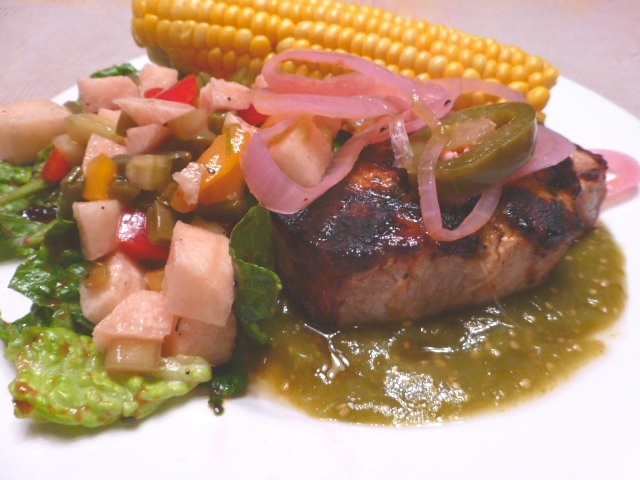 The salad was a perfect foil for another house favorite – grilled pork chop on tomatillo sauce. This time, the tomatillo sauce was homemade as part of the the cactus enchilada recipe development experiment. It is a good tomatillo sauce that I’ll make frequently. The chop is topped with a garnish of pickled red onion and jalapeños – a great compliment to meats and tart sauces. An ear of corn picked and frozen last summer tempers the heat of the salad and sauce. I had some leftover ground lamb from the lamb sliders the other night and I decided to improvise one of my favorites – moussaka – a lamb and eggplant dish that makes me swoon! I browned the lamb, pan broiled eggplant slices with a little olive oil and layered them in a sauce of tomatoes, oregano, garlic and grated parmesan. I made a béchamel sauce of equal parts butter and flour and thinned it with half and half. It may have been the best béchamel I’ve ever made and I wish I had made more of it! It was baked in a small loaf pan and yielded 1.5 servings for the two of us. Just right, because I’d have eaten a whole casserole of it by myself! 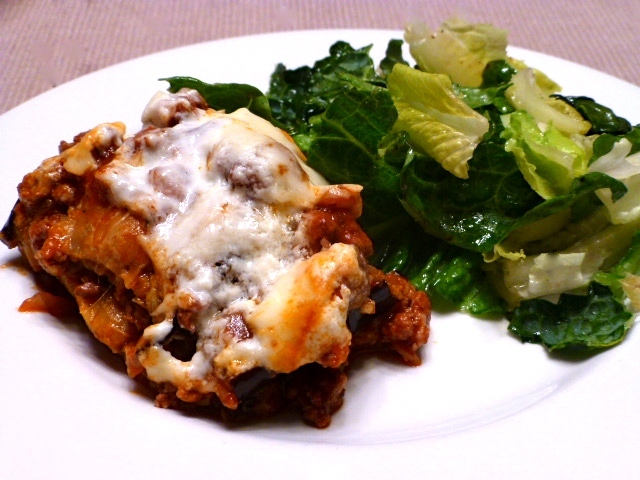 The moussaka was served with a side salad of lettuce and dinosaur kale in a simple vinaigrette. We have had a great visit with Jack’s sister, Kathy, from Kansas City, MO. A few days thawing from near zero temperatures in El Paso’s 70-80 degree February temperatures were a real treat for her. Kathy asked for grilled lamb patties for dinner the night before heading home so here’s what happened. Ground lamb seasoned with oregano and lemon zest was formed into patties. While the meat flavors blended, egg plant, zucchini, tomato and onion were massaged with olive oil and grilled. The veggies then were given a coarse chop and tossed with balsamic vinegar to create a grilled ratatouille as complementary side for the sliders. 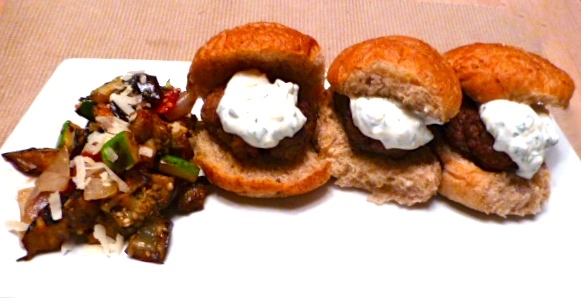 After grilling, the lamb was placed on 7-grain rolls and topped with a generous dollop of tzatziki. My tzatziki has a base of Greek yoghurt with minced garlic, a pinch of lemon zest and chopped mint. It is just right for topping the lamb sliders. And, of course, sliders must be served in three’s. 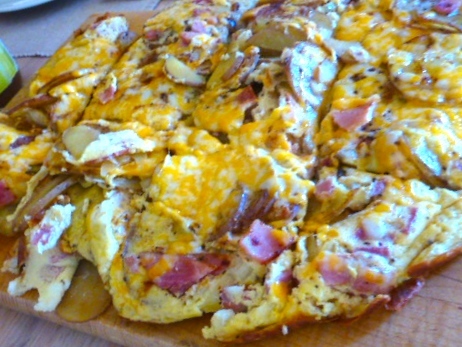 In Spain, a tortilla is an egg and potato dish usually served with other dishes as part of a tapas buffet. I went beyond eggs and potatoes on this one with the addition of diced ham, a smattering of chopped onion and a sprinkle of Hot Smoked Spanish Paprika. Maybe that turned it into a frittata? On the side, I had a couple of jars of salsa and some 3-inch corn tortillas that were a novelty for our guests from northern climes. It was another gluten-free very hardy meal that got every one off to a good start on a Sunday morning. What do you make for breakfast when someone living a gluten-free lifestyle visits? You scratch your head and look for products that fit in that category. How about Bob’s Red Mill all Purpose Baking Flour made from a blend of gluten free potato, sorghum, tapioca, garbanzo and fava bean flours! I modified my favorite recipe for mesquite meal waffles and came up with a very tasty waffle treat for breakfast that received rave reviews at the table. Thank you, Laura Makepeace for providing the inspiration for this dish! Combine dry ingredients in a large bowl and whisk to combine. In a separate bowl, beat eggs and stir in the buttermilk and oil. Add liquid to dry ingredients and whisk into a smooth batter. Cook in a Belgian Waffle maker until steam stops escaping. Note: mesquite flour makes baked goods darker than other flours, so don’t think you’ve overcooked it. 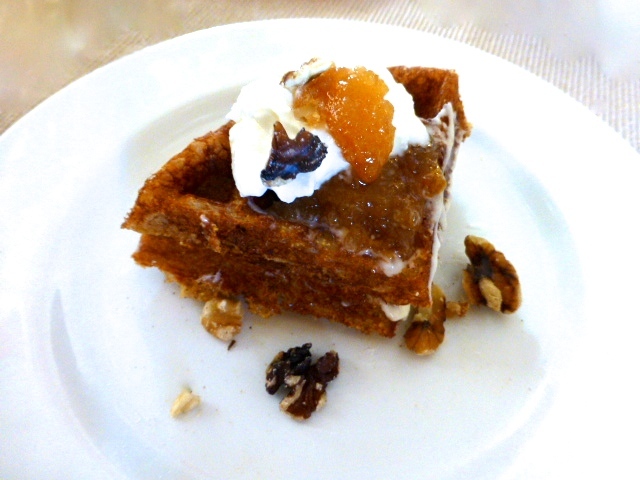 This waffle is topped with Greek yoghurt, a dollop of granulated honey and a sprinkle of walnuts. Very tasty, very health an sure to be made again. Sometimes a light dinner is just what you need. Start out by blistering halved grape tomatoes in a dry pan. Add crushed oregano, paper thin garlic slices, tomato paste and a little water to loosen the fond and get a moist sauce going. 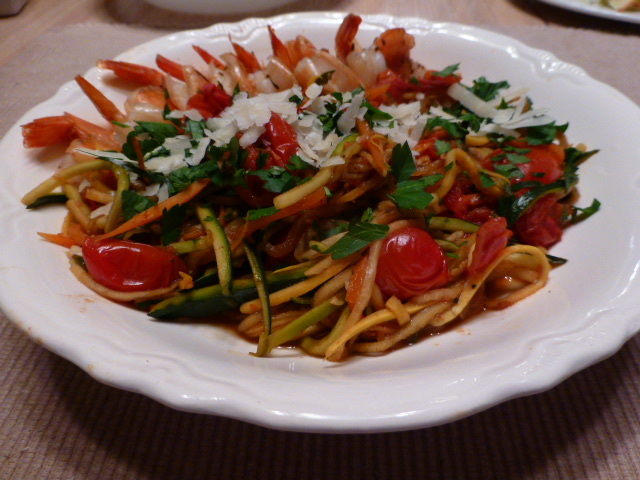 Then, add julienned strops of zucchini, yellow summer squash and carrot and sauté until al dente. Finish peel on shrimp that have marinated in olive oil and Emeril;’s Essence by cooking them in a dry pan until they are pink on both sides. Add to vegetables. Garnish with fresh grated parmesan and chopped Italian parsley. On the side were an apple and fennel salad and a whole wheat bollio (roll) sliced and seasoned like garlic bread, then heated in the oven. It is quick if you use a julienne peeler. And it is very tasty regardless. I’ve been inspired by Carnitas Queretaro’s wonderful enchipotladas – enchiladas sauced with a creamy rich blend of crema and chipotle peppers. I want to develop nopaladas – enchiladas with prickly pear cactus, chiles and a tomatillo and crema sauce. Here’s a first try from the Gringo Courmanderie Test Kitchen using all fire-roasted vegetables. 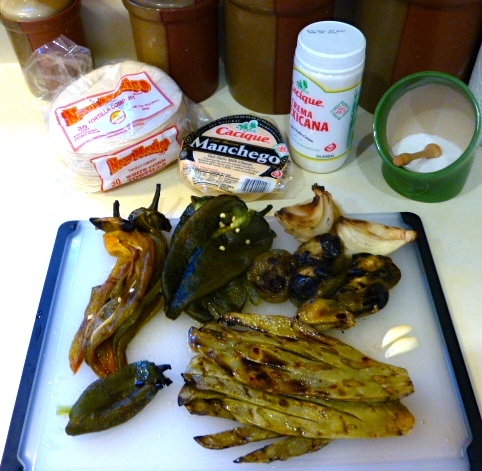 The tortillas were stuffed with strips of cactus, poblano pepper and Mexican Manchego cheese. It was pretty good and will be better with adjustments of tomatillo and crema. I’m also going to work on a non-roasted version of the sauce and then have a taste testing at some point in the near future. Ingredients for Test I: Fire roasted jalapeño, long green chile, poblano chile, tomatillos , onion and prickly pear pads and garlic, gorillas, Manchego cheese, crema and kosher salt. You can see the poblano pepper and cactus strips inside the rolled tortilla. This test was at breakfast, so there had to be eggs on the side! Keep checking to see how evolution process for both versions of the sauce. For Test II, I made a more traditional tomatillo sauce by boiling tomatillos, chiles, onion and garlic. After pureeing the vegetables, I let it cool. I had about a cup of sauce. I added 1/4 Cup of crema and let it chill in the refrigerator for a couple of days. Finger tip tasting was very good. Because I had houseguests, I decided they could be guinea pigs for this version of the recipe. 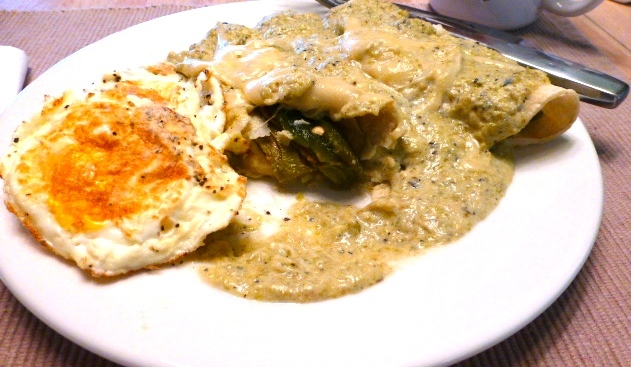 Remember, the goal is the creation of Nopaladas – cactus enchiladas in a tomatillo/crema sauce. I cooked up a batch of nopalitos and made the jicama and nopalito salad that is posted on here. Then Sous Chef Laura heated the tomatillo/crema sauce and we began to stack the enchiladas as a side dish. We used 3-inch corn tortillas layered with red onion, sautéed nopalitos, queso fresco and chopped cilantro and a dipper of sauce. We made three layers and garnished the stack with a sprinkle of cilantro and a ring of jalapeño pickled red onion for color and an extra tart kick to the crema rich sauce. The nopaladas were well received. There was a little too much chile heat for one taste tester from Missouri. I felt there was a little too much crema and will have to adjust that next text. The two other tasters wolfed them down and mumbled goooood, goooooood. That was reassuring! I also need to work on the color of the sauce. The cream makes it smoother and darker than I like. Perhaps a chunkier base sauce. Suggestions are welcome. Plated up: left front, noplada with jalapeño pickled red onion garnish; a small loin steak and jicama and nopalito salad. 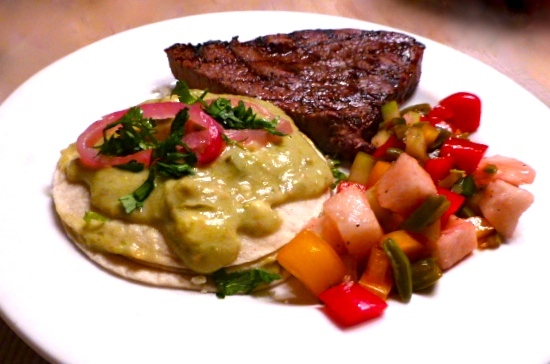 The Gringo Gourmanderie Test Kitchen is on the right track with this one!